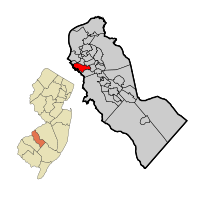 Bellmawr NJ Real Estate Info will help you learn about there, Camden Co, the USPS Processing Complex and I-295. This area has just about every major highway going through it - NJ Turnpike has an "Exit 3" there, I-295 goes through it, Rt 42 (The Atlantic City Expressway further east) and Rt 168. That expansion of highways has also created a lot of commercial areas in the town. The USPS has a very large processing plant there for sorting the US Mail.